Many people visit hospitals for healthcare. Hospitals are known for treatment of various diseases and healthcare of people. Healthcare and treatment of patients is possible only in calm and comfort environment. Hospital Furniture plays vital role in maintaining good environment in Hospitals. In hospitals, it is very important to have good quality furniture for good comfort of patients and ease of doctors while treatment. Mechanical Labour Table is manufactured with three section Stainless Steel plate body and is mounted on rubber shoes. It is provided with facilities to adjust backrest positions and trendlenburg positions. It is provided with IV Rod, self lock traction handle and two straps to hold legs. It has soft mattress fitted on stainless steel sheets which provides comfort to patients. Fixed Labour Table is manufactured with three section Bakelite sheets and is mounted on rubber shoes. Trendlenburg position is adjustable with pneumatic gas spring system. Backrest position is adjustable with ratchet system. Leg side can slide under the upper portion for easy cleaning. It is provided with side railings for safety. Adjustable Labour Table is manufactured with a three section SS Steel top and castors for easy movement. Trendlenburg positions and backrest positions are adjustable using pneumatic gas spring system and ratchet systems respectively. It is provided with three sided safety railings which can be removed. It has IV Stand and Steel bowl as accessories. DESCO India is the fastest growing hospital manufacturer team. We provide good quality product at reasonably good prices. 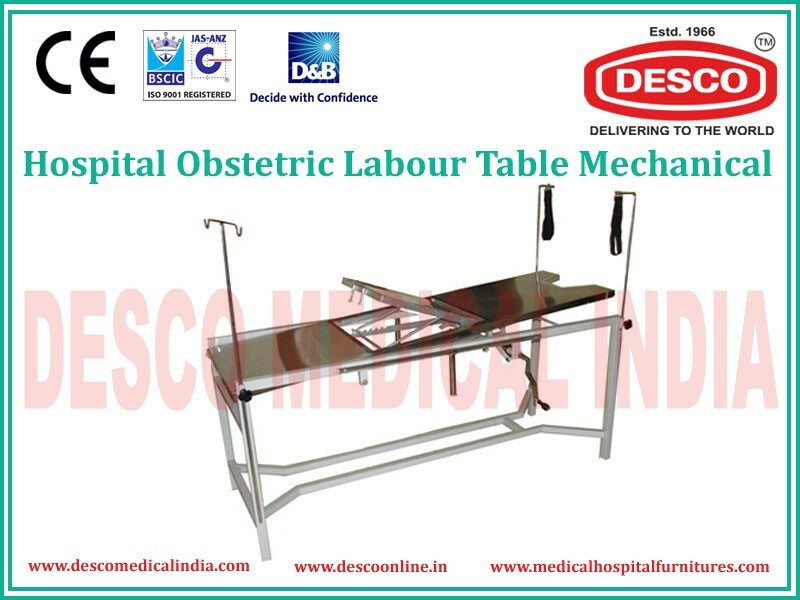 If you want any kind of Hospital Furniture, than DESCO India is the largest manufacturer of such products at affordable prices. Visit our website for the catalogue and product details.